Calculation of Electro Magnetic Field (EMF) is one of the factor which must be considered during the design process especially for high voltage transmission lines. It is common that based on those calculation, designer or planner may determine Right of Row (ROW) of the power line. Moreover the results of simulations prepared on the designing phase can indicate the impact on environment which ensure that proceeding solution will not be danger for the people and surrounding nature. It is matter-of-fact as in the worst case the wrong decision can even block realization of investment. Because of the alleged reasons it is important to take into consideration EMF calculations in order to utilize the best solution concerning both economy and environment aspects. The presented software states a tool which allows conducting calculations of EMF around transmission and distribution overhead lines. 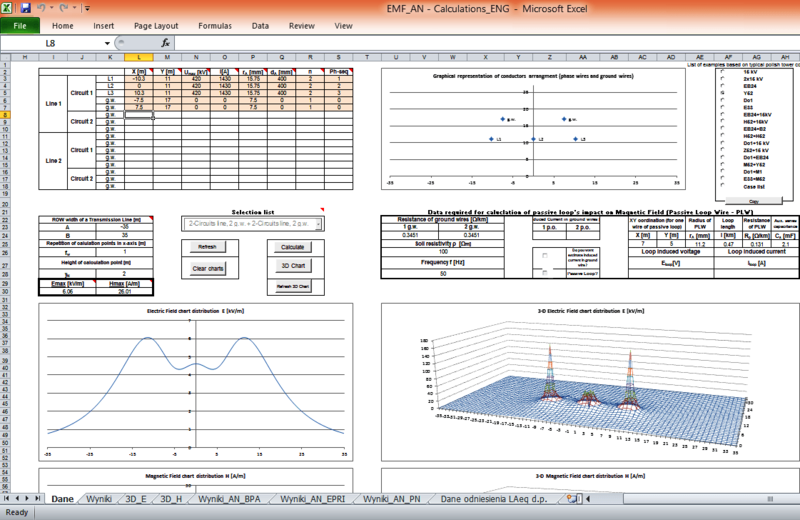 The results of calculations are presented on graphical charts as EMF distribution. It is allowed to calculate EMF for 1 circuit line as well as 2 circuit line. In each of cases ground wires may be considered. Moreover using different cases it is possible to mix and create major examples of power lines where two independent lines interact on each other. Electro-Magnetic Field is calculated in accordance to analytical approach described in EPRI Red Book “Transmission Line Reference Book”. Accuracy of these EMF calculations were checked with others commercial software. Model of Passive Loop Wire (PLW) intended for mitigation of magnetic field purposes. It provides a possibility to simulate influence of passive loop which is suspended below live conductors in span. Magnetic Field is mitigated by means of induced current which flow through the closed loop. Based on the literature this solution was tested in some real applications so it can be considered as a magnetic field limiting measure. Audible Noise (AN) distribution around transmission lines. The calculation of Audible Noise is strictly connected with EMF because the level of Audible Noise is another factor which influence on proper line design process. This program allows making calculation in accordance with three different methods determined by three independent authors. EPRI, BPA and PN-N-01339:2000 (polish standard). Results of calculations are presented as a cross-section distribution where different curves are depicted and represent different values of indicators. In combination with EMF calculations designer receives full range of information about environmental impact on surrounding of the transmission line as well as it may indicate building constraints. The information in the subject is very imperative to kept in mind during the selection of Right Of Way ( ROW) of a new HV Transmission Line passing nearby the residential , Industrial , Agricultural areas to cater the environmental issues.